Peter Crouch scored his fourth goal in five matches to record Stoke's 1-0 win against Hull at the weekend following their away victory against Aston Villa to win back to back matches for the second time this season. Stoke's last five defeats have come against the current top five teams in the Premier League, losing to Manchester City and Chelsea at home and suffering defeats away to Manchester United, Liverpool and Arsenal within their last 15 matches. Stoke City's 1-0 win at Goodison Park gives them the opportunity to do the double over Everton for the first time since the 1966/67 season when they followed up a 1-0 win away at Goodison Park with a 2-1 victory at home. Stoke look to finish above Everton in the league for the first time since 1980-81 when Stoke finished 11th and Everton finished 15th in the old first division. One of the reasons why this match is an interesting match up is because of the stark contrast between the sides compared to last season. There has been a 29 point swing between the two clubs at this point this season compared to the same stage of last season and Stoke have opened up an 11 point gap in the Premier League this season. Interestingly, Liverpool and Arsenal have dropped the points after Everton yet have only dropped 1 place in the league each. Should Everton lose on Wednesday night they'll be 20 points worse off from the same stage last year. Everton fell to a second successive away defeat with a 2-0 at the hands of Arsenal on Sunday, Everton's 11th defeat in 27 league games this season which is three more than they had in the entirety of last season. Everton haven't won in any of their last five matches at the Britannia stadium but have only lost on one occasion. Everton's current streak of eight matches without a draw away from home is the second longest in the premier league behind Queens Park Rangers (13), seven of which have resulted in defeats for the Toffees. Everton have conceded 14 goals and scored just four goals in their previous eight away matches and have only scored three goals in their previous five Premier League visits to Stoke. Mark Hughes has a pretty impressive record against his Everton counterpart having won 12/21 points available and only losing once to a Roberto Martinez side. Mark Hughes has seen his side handed two penalties in the above matches and a red card in one of the fixture whilst Martinez was awarded his first penalty in this match up during a 1-1 draw in this fixture last season with Leighton Baines scoring an injury time penalty whilst Bojan scored the only goal in the match at Goodison Park this year from the spot. The only red card in matches between both matches came in the very first meeting between both managers with Pablo Zabaleta seeing red for Mark Hughes' Manchester City side. I'm supremely confident going into this one blob. I don't know why but I've got a very good feeling we're going to get a win here. Maybe it's because you'd imagine Stoke won't sit back at home and therefore we should have too much for them unlike recent away matches at Chelsea and Arsenal where we've been in that situation. Those stats at the top of Shoguns's piece are appalling! 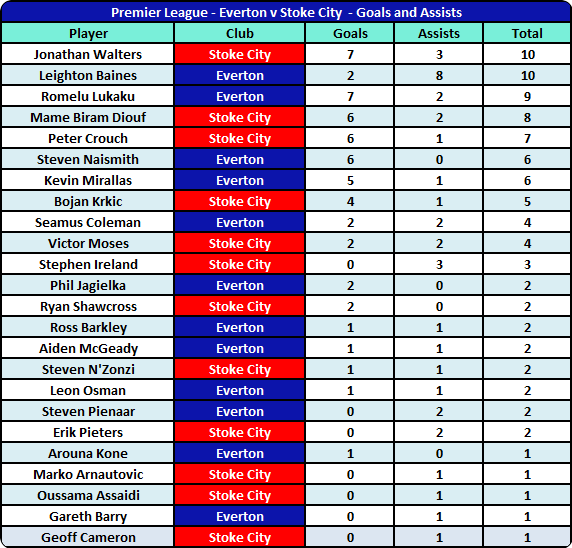 On paper Jonathan Walters is more affective than Lukaku. And to have Naismith and Barkley playing off the striker (I know they've been played wide, but still part of an advanced supporting 3, behind the striker) with 1 assist between them is our biggest problem. Really needs sorting. We will win because footy is weird, and because RM will convince the squad that it is, in fact, Thursday. feel a draw in my head, but the old ticker says 3-0 the blues. 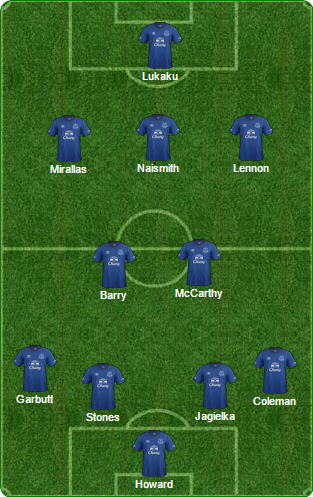 I would like that team but with Besic replacing Barry or McCarthy. Hopefully we will see Lennon and Mirallas starting but I imagine it will be the same old line-up with Naismith as one of the 'wide' players. and as much as i like besic, i'm also worried about how long he takes on the ball, and i think those passes he attempts, gibson can pull off a bit better. so maybe lose barry for gibson in a deep playmaking / possession carrying type role, and have gibson and mccarthy behind Barkley who plays a sort of free box-to-box role? it's all gone very FIFA career mode in this post. Awful reading, that 17 point drop off compared to this point last season. Can't be many others in recent history who have seen such a significant decline. United last season aside, I'm struggling to think of anyone else for whom the swing would be so big. I agree about McCarthy but Martinez does not like to rest Barry. I wouldn't play Barkley in this game as he seems to be knocked of confidence, I'd bring him back for the European game next week. 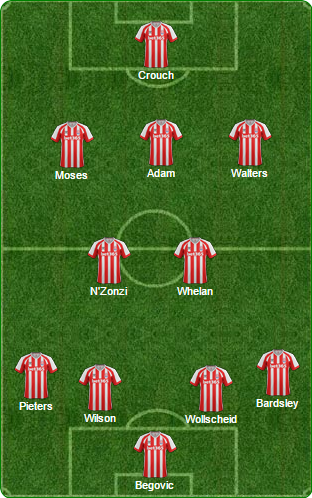 Lets just hope we play with 2 wide players and try and stretch Stoke's defence - I imagine they will sit back and make it very hard for us to break them down.